Swimming is a skill that can be enjoyed year-round, can help maintain fitness at any age, and could save a life. 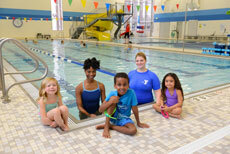 The YMCA offers Swim Lessons for all ages, starting as young as six months old. If your child is afraid of the water, or doesn’t like to be in the water, contact an Aquatics Manager to explore ideas to help and discuss how Swim Lessons might help. Group swimming lessons were invented at the YMCA—and since the start, the Y has been committed to teaching technical swimming skills, and so much more. You don’t have to be a YMCA member to sign up for Swim Lessons at the Y—they are open to everyone. If you’re not a member, here are a few tips on what to expect. For ages 5 and up, can you or your child swim halfway across the Y pool (12.5 yards) on the front and back without a flotation device? In addition to group lessons, customized swim lessons offer individualized attention—and are a great way to catch up or get ahead. It’s up to you to determine the goals you want to work toward, and we’ll match you with an instructor that can meet you where you are. Many Y locations also offer adaptive swim lessons for kids—contact an Aquatics Manager to learn more.